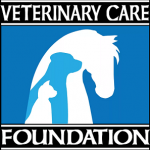 Veterinary Care Foundation is a 501(c)(3) not-for-profit charitable foundation created for the specific purpose of helping veterinary practices fund the discounted and no charge care they generously provide to hardship cases, rescue groups or as good samaritans. Unlike other veterinary charities, 100% of every contribution to the Veterinary Care Foundation and its member practices go directly to improving the quality of life of pets and their people; all Foundation operating expenses are met by membership dues paid by veterinarians. We make it easy for clients to donate, and all donations are tax-deductible. Click the image to learn more. Click here if you would like to donate!